The Folger's collections of materials related to William Shakespeare extend far beyond the First Folios. Explore some of the varied and unexpected treasures in our collection. [Titus Andronicus] The most lamentable Romaine tragedie of Titus Andronicus As it was plaide by the right honourable the Earle of Darbie, Earle of Pembrooke, and Earle of Sussex their seruants. 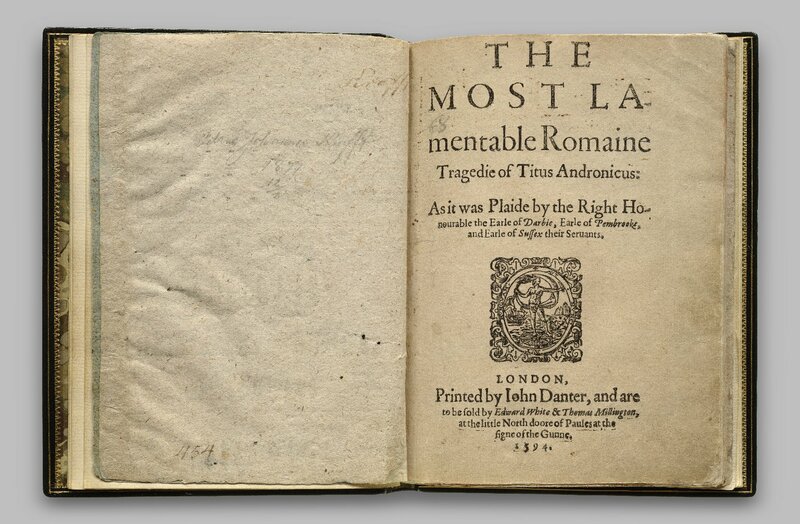 This is the only known copy of the first edition of Titus Andronicus, published in 1594, and one of the earliest examples of a published Shakespeare play. For centuries, the first quarto of Titus was thought to be lost entirely. This copy surfaced in 1904, in Sweden, at the home of a postal clerk; he is said to have seen a newspaper article about the sale of an early English Bible for an impressive sum of money, and it made him think of the worn little English book he had in his own collection. Henry Folger bought the book on the off chance that it was authentic. Happily for him (and us! ), it was. 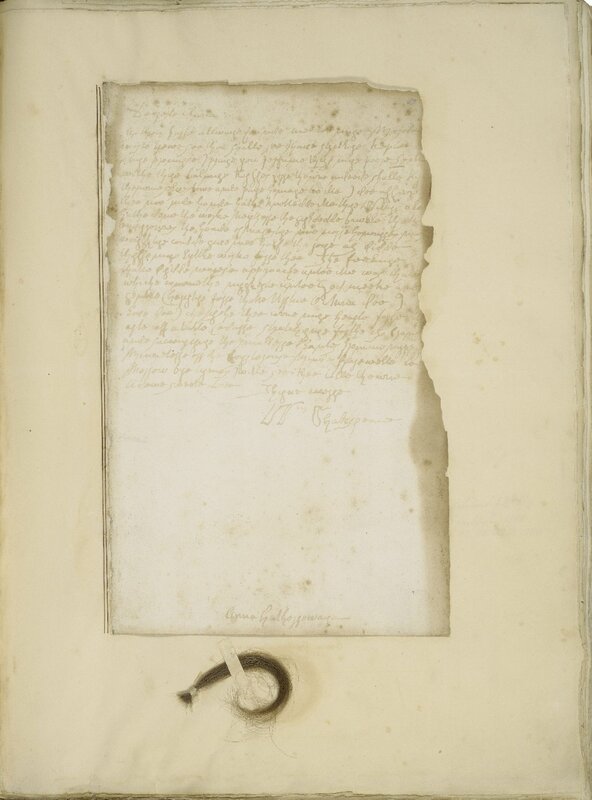 This manuscript is Shakespeare's copy of his deed of purchase of the Blackfriar's Gatehouse in 1613. This "gate-house" was a residence built partly above a gate in the wall surrounding the district, and it came with an enclosed garden plot. Though it was near Blackfriar's Theatre in London where his acting company performed, Shakespeare did not live there but seems to have bought the property as an investment. By 1613, Shakespeare—who was probably retired at this point—had purchased several investment properties in Stratford-upon-Avon; the Gatehouse appears to have been his only investment purchase in London. 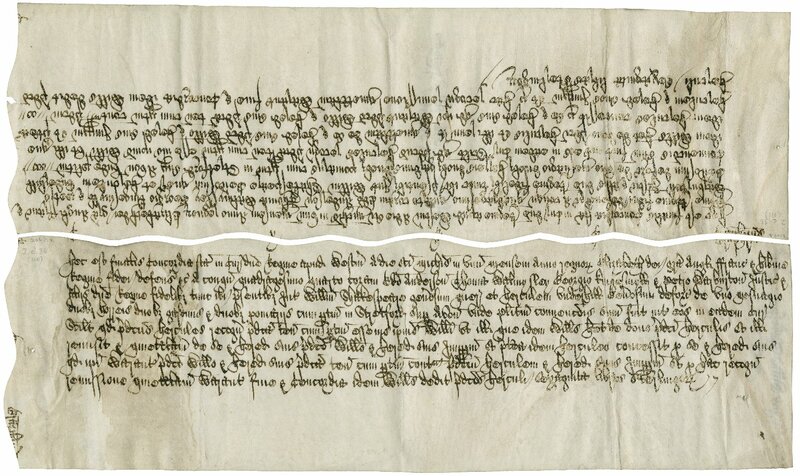 The wavy cuts at the top of the document are called "indentures" and were a method of proving authenticity. If there was ever a question about the deed, the buyer and seller could compare their halves of the document. If they fit together, like pieces of a puzzle, the document was genuine. Known as the "Final Concord" of 1602, this is one of the few documents held at the Folger that seems likely to have passed through Shakespeare's own hands. The Final Concord confirms Shakespeare's title to his house, known as New Place. This was the second largest house in Stratford and the home where Shakespeare died in 1616. There was some legal wrangling with New Place. 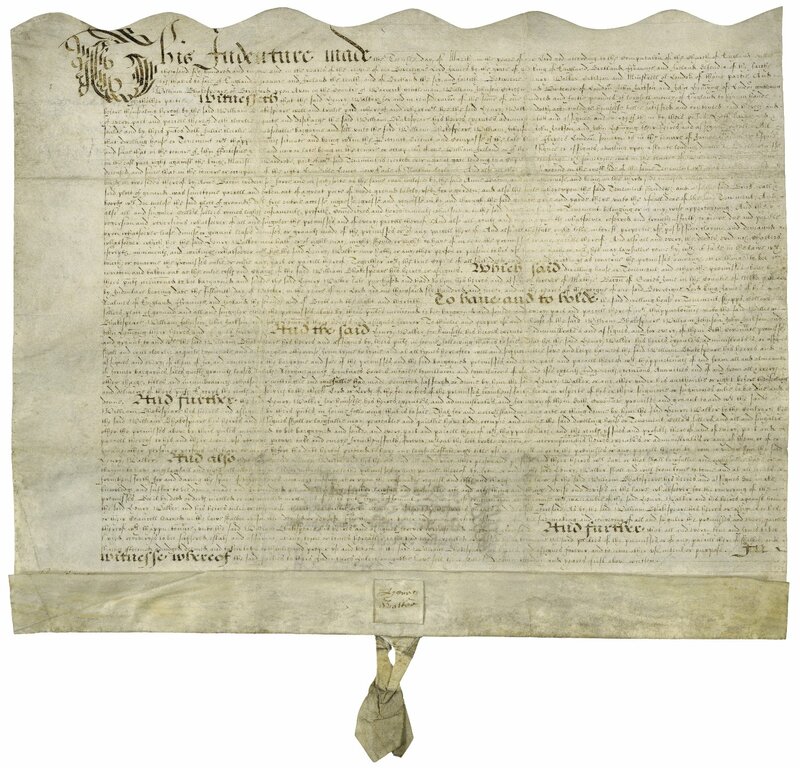 Shakespeare purchased it from William Underhill in 1597. Unfortunately, Underhill was shortly thereafter poisoned by his elder son, Fulke, which potentially called the sale of the house into question. Fulke was subsequently hanged in 1599. Once the younger Underhill son, Hercules, came of age, Shakespeare paid Hercules to confirm—or "concord"—his purchase of the property. [Works. 1623] Mr. VVilliam Shakespeares comedies, histories, & tragedies : published according to the true originall copies. 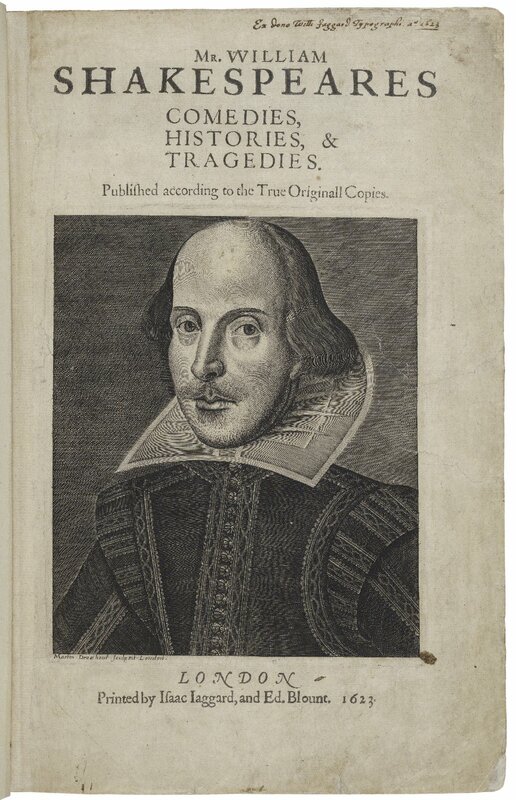 The Folger has 82 copies of the 1623 First Folio, the first edited of Shakespeare's collected plays. This copy, however, has pride of place as copy number 1, thanks to the significance of its former owners. In the upper right corner is an inscription marking the book as a gift from the book's printer, William Jaggard, to his friend Augustine Vincent. 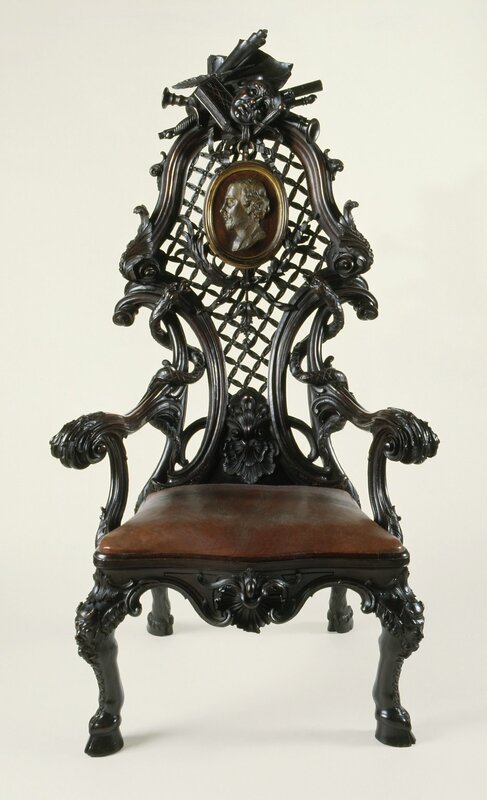 This mahogany chair was designed by William Hogarth for noted 18th-century Shakespearean actor David Garrick. Garrick, in addition to being an actor, theater manager, and playwright, was the president of the Shakespeare Club, and even had a Temple to Shakespeare on the grounds of his home in Hampton. This chair, displayed by Garrick in his Temple, is ornately carved with symbols of literature, theater, and the arts. It has been described by Samuel Ireland as "rather surcharged with ornaments," and by others as "a kind of grim grotesque" and "demented baroque." Whatever your opinion of the style, the chair certainly is a conversation starter. Sculpture of Shakespeare: Study for statue for David Garrick's Shakespeare Temple. David Garrick commissioned a sculpture of Shakespeare to be included in his Shakespeare Temple. 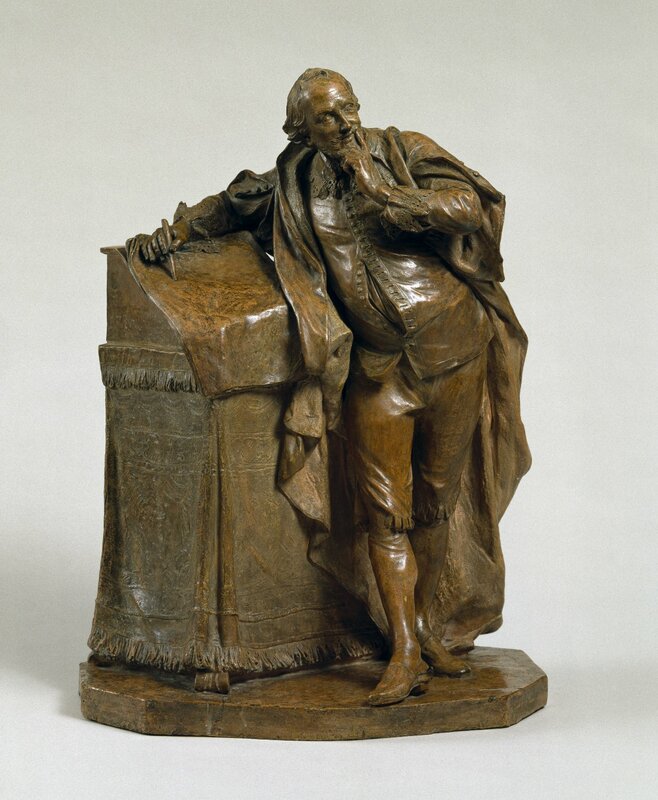 This terracotta study (about 22 inches high) was made by French sculptor Louis François Roubiliac in 1757 in preparation for the life-sized marble statue, with Garrick himself serving as the model for the dramatic pose. This statue is an excellent example of how Shakespeare the man has been romanticized over the centuries. Roubiliac clearly attempted to capture creative contemplation, with the figure posed, pen in hand, gazing thoughtfully into the distance. The final marble version that was carved for Garrick's home (and now at the British Library) is more tranquil: the eyes are less animated, and the left hand has moved so that it supports Shakespeare's chin rather than distorting his face. This purported love letter from William Shakespeare to Anne Hathaway (complete with a lock of "Shakespeare's" hair) was created by 18th-century forger William Henry Ireland. Ireland "discovered" a cache of Shakespeare manuscripts when he was 17. At first, Ireland's contemporaries (particularly his father, Samuel Ireland) accepted them as authentic, and Ireland continued his forging practice with this letter. However, Ireland's career as a Shakespeare forger came to an end when he pushed the envelope a little too far: the "new" play by Shakespeare, Vortigern, was laughed off the stage and the whole scheme came crashing down. Ireland eventually confessed, although even his confession may not have been entirely true. This costume was worn by American actor Edwin Booth in the title role of Richard III, sometime in the 1870s. Booth came from one of the most noted (and notorious) theater families of the mid-19th century; his father, Junius Brutus Booth, was a noted tragedian in both England and the United States, and his brother, John Wilkes Booth, was a successful actor before becoming a household name as the assassin of President Lincoln. Edwin himself was one of the most noted and well-respected Shakespearean actors in the second half of the 19th century. Although he became most well known for his portrayal of Hamlet, Edwin played most of the Shakespearean tragic roles. 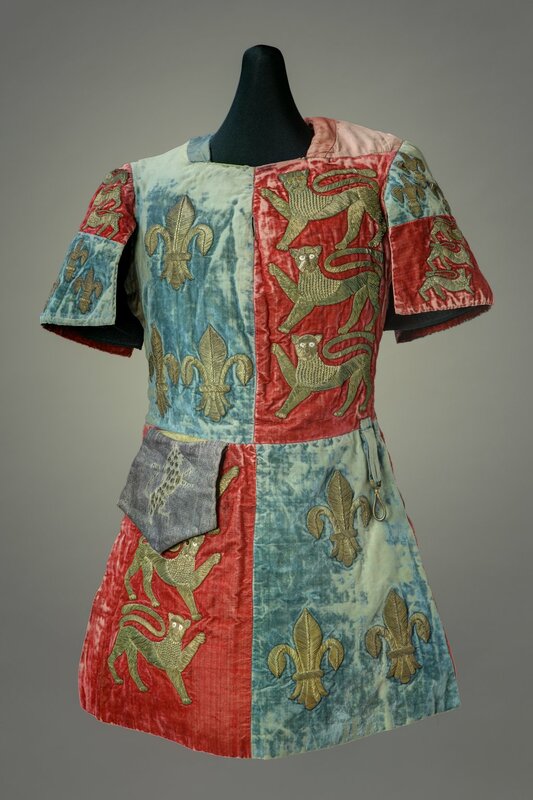 In keeping with the period's drive for historical accuracy in theatrical costumes, this garment incorporates Richard's royal coat of arms. 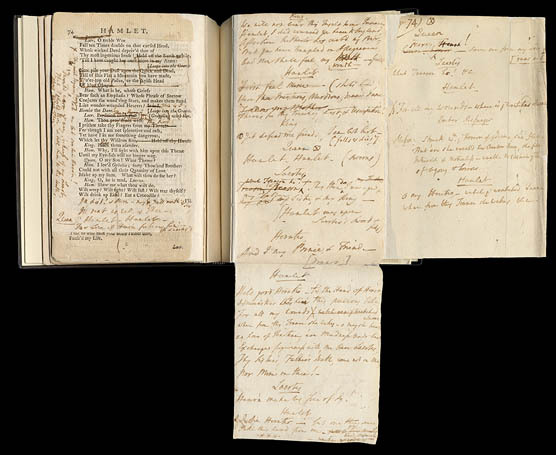 This promptbook—a copy of the play with notes, staging, sometimes even costume and set design—was annotated by David Garrick for his controversial 1773 reworking of Hamlet. Although not ready to use during a performance, this book clearly shows Garrick's thought process for his major reworking of the play. Garrick reinstated nearly 600 lines in the first three acts, and then made substantial cuts to acts four and five, including the gravediggers' scene and the fencing match between Hamlet and Laertes, both of which Garrick considered "rubbish." 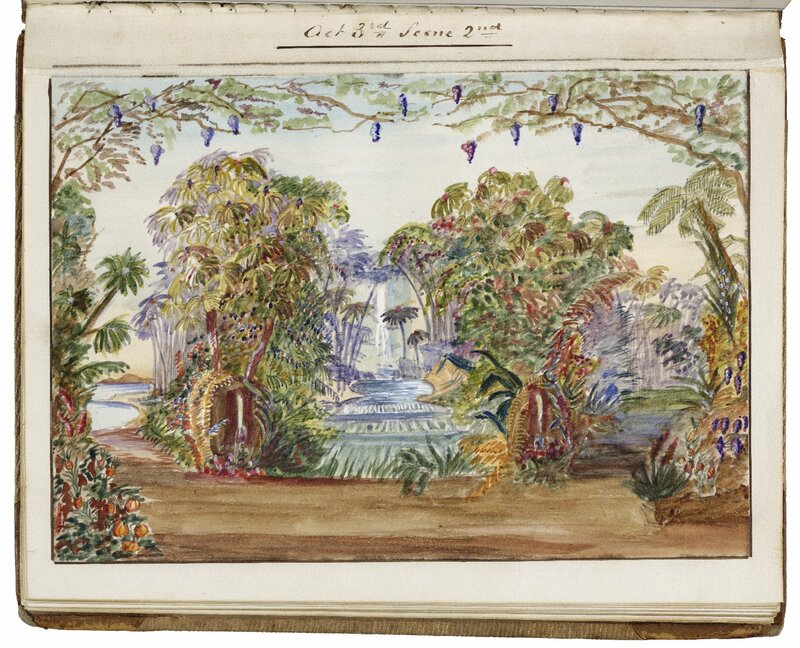 This watercolor sketch shows the set design for Act 3, scene 2 of The Tempest from Charles Kean's 1857 production at the Royal Princess's Theatre London. Kean was one of the great Shakespearean actor/managers in London during the mid-19th century; he also produced Shakespeare plays at Windsor Castle for Queen Victoria. A "souvenir promptbook," such as the one this watercolor is from, was produced to commemorate a particular production; it would include set and costume designs, staging directions, and possibly notes about the well-known actors. Paul Robeson graduated from Columbia Law School in 1923, but soon left the legal profession to pursue an acting career. However, as a black actor in the segregated United States, he was frustrated by the limited opportunities available, and sought (and found!) success on the London stage. There, Robeson played the title role in Eugene O'Neill's Emperor Jones in 1925 and stood out in the 1928 musical Show Boat. 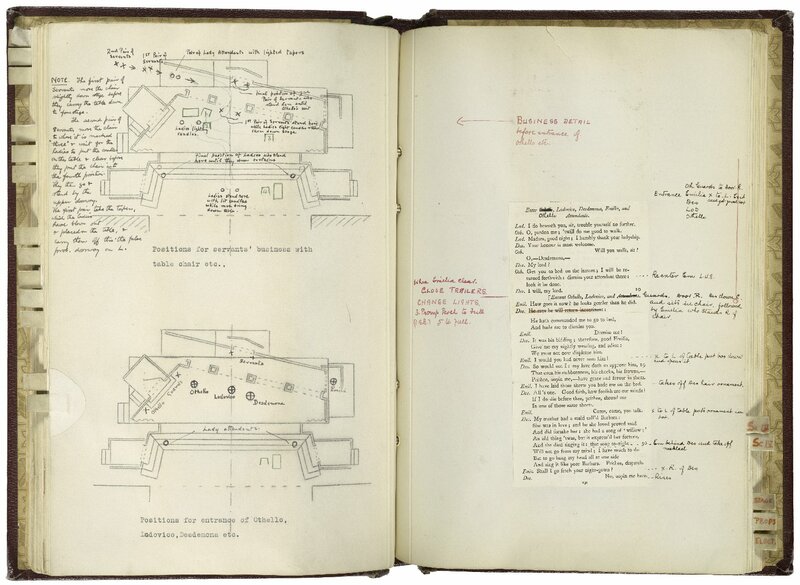 This promptbook documents the 1930 London production of Othello in which he starred opposite Peggy Ashcroft—a mixed-race casting for the classic play that would have been unthinkable at that time in the United States. The promptbook meticulously records the cuts, musical cues and staging for the production, as well as the set, costume, lighting and prop designs.